You are running a 5.5 virtual center with a virtual machine specs: windows 2012 R2, vm hardware 8, 6 vpu’s (6 sockets/1 core per socket). The physical ESXi host has 4 processors with 6 cores each. I want to give the vm 8 vcpu’s without causing memory latency due to cross socket traffic. I want to set the Virtual NUMA configuration such that it replicates the Physical NUMA architecture so Windows 2012 aligns it’s memory to the 2 physical NUMA nodes. Since this increase to 8 will need use 2 physical sockets, I wanted to know if cupid.coresPerSocket & numa.vcpu.maxPerVirtualNode need to be added to the VM? I read through https://communities.vmware.com/blogs/VirtualPharaohs/2014/09/06/many-cores-per-socket-or-single-core-socket-mystery “By default, vNUMA is enabled only for virtual machines with more than eight vCPUs” – I suspect the reason for this is most modern CPU’s have 8 physical cores per socket. 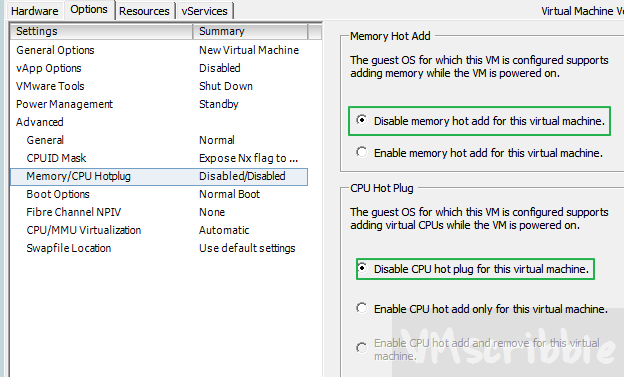 NOTE – If you built the VM with 10 or more vCPU’s, this post does not apply. numa.autosize – if you want vNUMA to be updated with each power cycle, then set this to TRUE. We want FALSE since we are setting this by hand. cpuid.coresPerSocket – Only used if even #’s are the result. Run coreinfo.exe -n -s to see how windows see’s sockets 0 and 1 (the physical NUMA structure). There will be 2 NUMA Node Maps vs 1 line. If you have an odd # (10/2=5) you will have to use the numa.vcpu.maxPerVirtualNode and not cpuid.cores.PerSocket.